These lilies were transplanted two years ago but this is the first year they have bloomed in abundance. 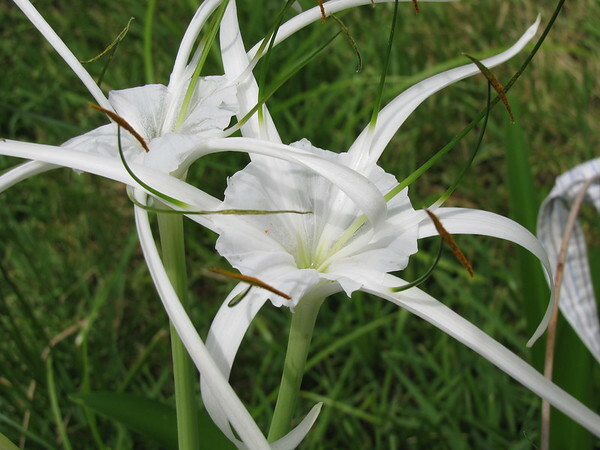 For many years I have spotted these lilies on the sides of the roads mostly in swampy areas and thought I would like to have some in my gardens. A co-worker gave me these–hopefully they will spread back toward the shed and the banana plant. Our neighbor across the street has an elderberry bush hanging over the fence. Last year I picked all I could from the sidewalk and made a small batch of elderberry jelly. I grew up on this stuff–my mother would put up pint jars of it and frequently also made elderberry syrup for the rare occasions she made pancakes. We put some on our plate, buttered a piece of bread and sopped it up as a desert. Hot biscuits were best–and sometimes we also had sorghum consumed in the same fashion. This year the elderberry crop was small, probably because I had harvested so many from the previous year and the birds seem to really love it gauging from the evidence of their meal on the sidewalk. So I’ll have a really small batch this year–and maybe my friend in Wisconsin will make some for me—-her father had her convinced elderberries were poisonous. Although we had elderberries in our woods, my mother refused to use them, claiming they might be dusty from the road–she always got hers from her mother’s house in town. It was our job to sit on the cistern and pluck the berries from the stems as best we could putting them in a large pot along with crab-apples. Now it seems that elderberry jelly is a prized commodity in the grocery stores around here–more expensive than grape–and the syrup is one of the fancy flavors at IHOP.